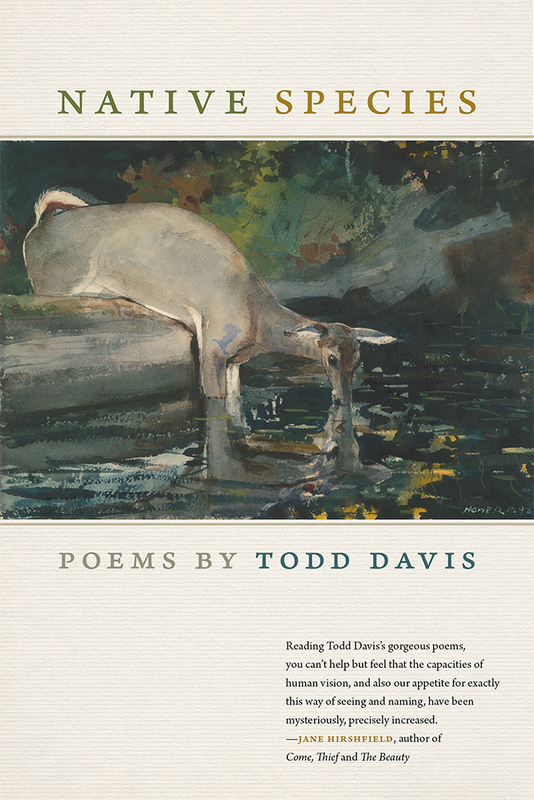 In his sixth book of poetry, Todd Davis, who Harvard Review declares is “unflinchingly candid and enduringly compassionate,” confesses that “it’s hard to hide my love for the pleasures of the earth.” In poems both achingly real and stunningly new, he ushers the reader into a consideration of the green world and our uncertain place in it. As he writes in “Dead Letter to James Wright,” “You said / you’d wasted your life. / I’m still not sure / what species I am.” To that end, Native Species explores what happens to us—to all of us, bear, deer, mink, trout, moose, girl, boy, woman, man—when we die, and what happens to the soul as it faces extinction—if it “migrates into the lives of other creatures, becomes a fox or frog, an ant in a colony serving a queen, a red salamander entering a pond before it freezes.” He wonders, too, “How many new beginnings are we granted?” It’s a beautiful question, and it freights, simultaneously, possibility and pain. These are the verses of a poet maturing into a new level of thinking, full of tenderness and love for the home that carries us all. Todd Davis is the author of five full-length collections of poetry. He teaches environmental studies, creative writing, and American literature at Pennsylvania State University's Altoona College. “The poems in this extraordinary collection ruffle and rasp from “the spiraled song of a hermit thrush, like a hand / that pushes against the solid door of a veiled world.” Davis’s command and keen survey of the outdoors is at once majestically extensive and disarmingly precise and compassionate. And yet these nature poems do what most cannot: in spite of fanciful moments where one can wake “to a hummingbird / beating its wings / against the roof of my mouth,” they also serve as a much-needed guidepost and catalyst for wanting to create even more songs of this complicated earth.